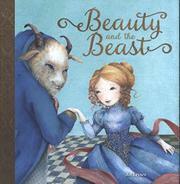 A plainspoken retelling of the classic tale with dreamy illustrations. In an uncredited translation from Dutch, Leysen pairs a shortened and lightly massaged retelling of the LePrince de Beaumont version to diaphanous views of Belle—a strawberry-blonde white waif with exaggeratedly wide-set eyes over a rosebud mouth—and a well-groomed, goat-headed Beast who looks more vulnerable than fearsome. Hearing her father’s tale (complete with the Beast’s “Alright! I’ll let you live, on one condition…”), Belle rides off to durance far-from-vile, where she resists the Beast’s nightly proposals. When lonely Belle goes home to visit, she is drugged by her “lazy and insufferable” sister (there’s just one in this version), dreams of Beast’s decline, and wakes up “bathed in sweat” to hie back to the castle and declare her love. Next day at the wedding her sister is transformed by the fairy who had earlier transformed the Beast into a statue until “a kind prince would come by to melt her heart.” Belle’s bed in the pictures is different than the one described in the narrative, and occasional monochrome drawings serve no evident purpose except to make the suite of languid illustrations look unfinished.